Custom Wood Fibers makes several varieties of animal bedding ranging from shavings to different fiber sizes. With our custom wood screening and sizing process we can eliminate dust and produce many different sizes and variations of animal bedding depending on our customers needs. This is our regular sized shavings These shavings are used for horses and other livestock. This type of shaving comes as is or with the dust removed depending on the application. This fiber has had the dust taken out of it so dust is not stirred up in the air as animals move around. Good uses for this is in cold rooms for cattle along with other livestock stalls and arenas. This type of animal bedding has many benefits. It has a pleasant aroma to help with smells. It is easier to clean stalls due to the clean fibers falling through the stall forks, which helps keep more fiber in the stall and less waste. Also, the oil in the fiber helps with keeping fleas and ticks away. 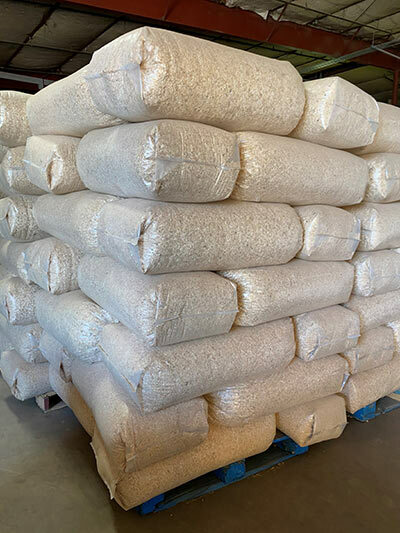 All of the animal bedding can be purchased at our facility in Oklahoma City in bulk by the cubic yard. The shavings can be purchased in 4 cubic foot bags. The cedar fiber can be purchased in 40 lb bags. If larger bulk orders are needed Custom Wood Fibers can also provide delivery with our 53 foot walking floor trailer.